Anahita is ancient Persian water goddess, fertility goddess, and patroness of women, as well as a goddess of war. Her name means “the immaculate one“. She is portrayed as a virgin, dressed in a golden cloak, and wearing a diamond tiara (sometimes also carrying a water pitcher). The dove and the peacock are her sacred animals. 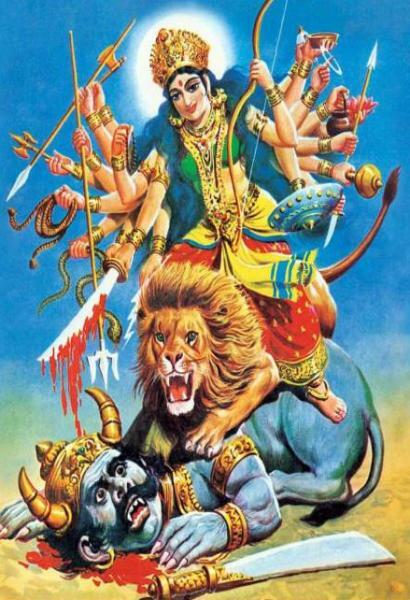 She rides a Lion, which is similar to Goddess Durga represented in Vedic texts. Goddess Anahita has earlier form as Aredvi Sura Anahita (Arədvī Sūrā Anāhitā); the Avestan language name of an Indo-Iranian cosmological figure venerated as the divinity of ‘the Waters‘ (Aban) and hence associated with fertility, healing and wisdom. Aredvi (sounds like ArYAdevi, Sura in sanskrit means God, Anahita sounds like Anahata, which is heart chakra in Yoga). The Greek and Roman historians of classical antiquity refer to her either as Anaïtis or identified her with one of the divinities from their own pantheons. 270 Anahita, a silicaceous S-type asteroid is named after her. Only Arədevī is specific to the divinity. It might have been distorted form of Arya devi. The above image is a seal produced after the fall of the Achaaemedis and is traceable to the post-Achaemenid dynasties of Anatolia known as Commagene, Cappadocia and the Pontus. The seal was discovered along the northeastern shore of the Black Sea (Consult Collon, 1987, no. 432) in the region of the ancient Pontus and now in the British museum. Goddess Anahita is sometimes confused with Ishtar. 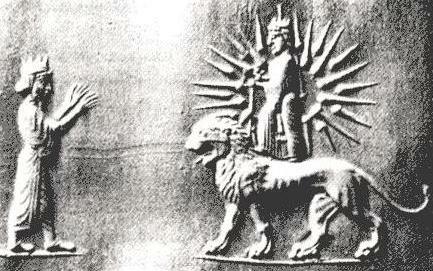 The seal shows the sun emanating 21 rays, the same symbol which is used by varous ancient Iranic cults among the Kurds of Iran, Iraq and Turkey. The 21 rays may be related to the festival date of Mehregan (Festival of the Sun-god Mithra) which takes place from the 16th to the 21st of Mehr of the Iranian calendar. In Egyptian mythology, Sekhmet /ˈsɛkˌmɛt/ or Sachmis (/ˈsækmɨs/; also spelled Sakhmet, Sekhet, or Sakhet (sounds like sakhi or sakti), among other spellings) was originally the warrior goddess as well as goddess of healing for Upper Egypt, when the kingdom of Egypt was divided. Sekhmet’s name comes from the Ancient Egyptian word “sekhem” which means “power or might“. Sekhmet’s name suits her function and means “the (one who is) powerful”. She also was given titles such as the “(One) Before Whom Evil Trembles”, “Mistress of Dread”, “Lady of Slaughter” and “She Who Mauls“. Durga means, one who pulls you out of ‘Dur-Gati‘ (bad phase or evil). There are 9 forms of durga and one of them is Kushmanda, which is worshipped on 4th night of Navratri. She rides on a tiger, unlike Durga who rides on a lion. Many depictions mix lion and tiger as her mount. But, vedic texts describe her a ‘Simha-Vaahini‘, which means rider of Lion. The form of Mahishasura Mardhini rides a Lion. The word Sherawali must have created confusion as Sher means Tiger and Babbar-Sher means Lion. Ku means “a little,” Ushma means “warmth” or “energy“, and Anda means “cosmic egg.” She is considered to have created the universe with her divine smile. She needed little energy to create cosmic egg (universe). Kushmanda has the power and strength to live in the core of the Sun. Her luminosity gives the Sun its brightness. She is said to give direction to the Sun God, Surya. The original form is Ambica, who rides a lion with 8 arms and in Bhagavata Purana, Lord Krishna describes her in 2nd chapter (11, 12 slokas). He says that Goddess Ambica Parabhattarika will be worshipped in the forms of Durga, Bhadrakali, Vijaya, Vaishnavi, Kumuda, Chandrika, Krishna, Madhavi, Kanyaka, Narayani, Maya, Eeswari, Saarada and Ambica across generations.